Claiming that his work was based on the fantastical and unreal, Ray Bradbury was an American fantasy and horror author who rejected being categorized as a science fiction author. His more than five hundred published works –short stories, novels, plays, screenplays, television scripts, and verse—are considered to exemplify the American imagination at its most creative. 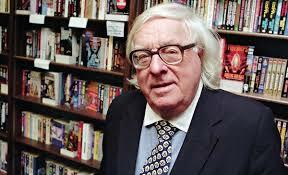 In recognition of his stature in the world of literature, Bradbury was awarded the National Book Foundation’s 2000 Medal for Distinguished Contribution to American Letters and the National Medal of Arts in 2004. He is remembered for several popular works, including The Martian Chronicles and Something Wicked This Way Comes. Tomorrow I’ll review his perhaps best-known novel: Fahrenheit 451. Save the date: September 23! Born August, 1920, in Illinois, Bradbury was the son of Leonard Spaulding Bradbury, a lineman for power and telephone utilities, and Ester Moberg Bradbury, a Swedish immigrant. According to Biography, he enjoyed a relatively idyllic childhood, which he later incorporated into several semi-autobiographical novels and short stories. An non-athletic child who suffered from bad dreams, he relished the tales of the Brothers Grimm and the Oz stories of L. Frank Baum, which his mother read to him. An aunt took him to his first stage plays, dressed him in monster costumes for Halloween, and introduced him to Poe’s stories. Along the way, Bradbury also discovered the science fiction pulps and began collecting the comic-strip adventures of Buck Rogers and Flash Gordon. New York Times states that the impetus for Bradbury to become a writer was supplied by a carnival magician named Mr. Electrico, who engaged the twelve-year-old Bradbury in a conversation that touched on immortality. Biography notes that Bradbury later said that he made the decision to write in hopes of emulating his heroes, by “living forever” through his fiction. In 1934, the family moved to Los Angeles. 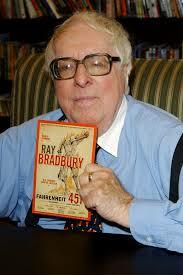 There, Bradbury became a movie buff, sneaking into theaters as often as nine times a week by his count. He also participated in his school’s drama club and occasionally even befriended Hollywood celebrities. New York Times notes that a high school English teacher and the professional writers whom he met at the Los Angeles chapter of the Science Fiction League encouraged Bradbury in his lifelong routine of pounding out at least a thousand words a day on his typewriter. Biography reports that his first official pay as a writer came for contributing a joke to George Burns’s Burns & Allen Show. Just before the United States entered World War II, Bradbury sold his first professional piece, a story called “Pendulum”. Ruled ineligible for military service by his local draft board because of his vision problems, Bradbury became a full-time writer by early 1943. His next publication success came in 1947 with the short story “Homecoming,” narrated by a boy who feels like an outsider at a family reunion of witches, vampires and werewolves because he lacks supernatural powers. New York Times records how The story, plucked from the pile of unsolicited manuscripts at Mademoiselle by an editor named Truman Capote, earned Mr. Bradbury an O. Henry Award as one of the best American short stories of the year. Along with 26 other stories in a similar vein, “Homecoming” appeared in Bradbury’s first book, “Dark Carnival,” published by a small specialty press that same year. 1947 was a meaningful year for Bradbury in other ways too. He married Marguerite McClure, whom he met while she was working as a clerk at a bookstore. She served as the breadwinner in the early days of their marriage, supporting Bradbury while he worked on his writing for little to no pay. The couple had four daughters. Three year later, Bradbury published his first major work, The Martian Chronicles. While taken by many to be a work of science fiction, Bradbury himself considered it to be fantasy. Biography provides this quote: “I don’t write science fiction. Science fiction is a depiction of the real. Fantasy is a depiction of the unreal. So Martian Chronicles is not science fiction, it’s fantasy. It couldn’t happen, you see?” According to New York Times, critics who those days dismissed science fiction as adolescent prattle, instead praised Chronicles as being stylishly written morality tales set in a future that seemed just around the corner. New York Times also notes that the audience for science fiction at the time, published mostly in pulp magazines, was small and insignificant. Therefore, Bradbury looked to a larger audience: the readers of mass-circulation magazines like Mademoiselle and The Saturday Evening Post. These readers had no patience for the technical jargon of the science fiction pulps and so he eliminated the jargon. Famously prolific, Bradbury wrote for several hours every day throughout his entire life, allowing him to publish over five hundred published works. Despite a distaste for television, Bradbury advocated for film adaptations of his work. Television and comic book adaptations of Bradbury’s short stories began to appear in 1951, introducing him to a wider audience. Decades later, In 1986, Bradbury developed his own HBO television series, “Ray Bradbury Theater,” a cable series which allowed him to produce adaptations of his short stories. While Bradbury championed the space program as an adventure that humanity dared not shirk, he himself apparently was content to restrict his own adventures to the realm of imagination. He lived in the same house in Los Angeles for more than 5o years, rearing four daughters with his wife. For many years, reveals New York Times, Bradbury he refused to travel by plane, preferring trains, and he never learned to drive. Though he preferred the sedentary writing life, Bradbury was not reclusive. He developed a flair for public speaking and was widely sought after on the national lecture circuit. There he talked about his struggle to reconcile his mixed feelings about modern life, a theme that animated much of his fiction and won him a large and sympathetic audience. And he talked about the future, describing how it both attracted and repelled him, leaving him filled with apprehension and hope. Bradbury wrote well into his 80s, dictating for three hours at a time to one of his daughters, who would transcribe his words to the page. Though he curtailed much of his traveling and public appearances in his senior years, he did grant several interviews as well as help raise funds for his local library. In 2007, Bradbury received a special citation from the Pulitzer board for his “distinguished, prolific and deeply influential career as an unmatched author of science fiction and fantasy.” In his final years, Bradbury felt content about his place in the annals of science fiction history, having achieved his childhood ambition of living forever through his work. He died in Los Angeles on June 5, 2012, at the age of 91. An inspiration to countless, Bradbury’s works will be remembered for decades to come. 2 Responses to "Graduated from Libraries, Author Ray Bradbury"
This is a pingback. I approved it because the author’s post is about the impact of books on one’s education and includes a relevant quote by Ray Bradbury.